History: Parrot feather waterfoil is an invasive species found in many subtropical and warm-climate regions but has been found as far north as the UK. The earliest record of this weed in the United States in 1906 in Florida. This invasive species is usually found in small bodies of water such as irrigation channels, streams and creek. Parrot feather impedes flow, causes water deoxygenation and other environmental problems. Stems and Leaves: The stems of parrot feather float over the top of the water and form dense tangled bundles of plant material. Stems can stand up to five feet while leaves are 1.5 to 5 cm. The leaves are feather-like, grayish green and can extend 30 cm over the water. Leaves of the parrot feather typically have 20 or more linear divisions on each leaf. Flowers and seeds: Parrot feather has small white flowers on the emergent shoot and are about 1/16 of an inch long. Methods of Reproduction: The parrot feather reproduces by spreading fragments and from people intentionally planting this weed. 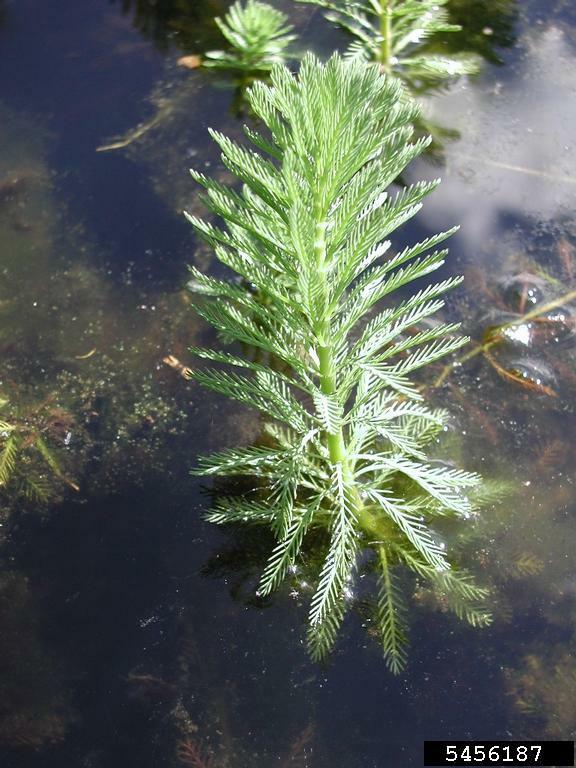 Environments favorable for infestation: Parrot feather watermilfoil prefers small bodies of water like creeks and streams or irrigation ditches. Environmental impacts: Parrot feather causes water deoxygenation and can impede water flow in streams and irrigation ditches causing a higher chance of flooding in those areas. Range: Parrot feather prefers tropical warm climates. It is spread throughout Australia, Africa and some parts of Europe naturally and is invasive in Kenya, Tanzania and has been found in 26 states in the United States. Prevention: To prevent parrot feather in new areas it must be prohibited from sale by the water garden and aquaculture industries. Mechanical: So far there is not a good way to prevent or control this weed physically. Cutting this plant only spreads it more and hand pulling offers little control and much labor put in to haul out the dense bundles of plants. Biological: The grass carp (Ctenopharyngodon idella) and leaf feeding beetle (Lysathia spp.) have been used to control the Parrot feather weed. Although the grass carp is not recommended since fish generally avoid eating this plant due to its high tannin content. The leaf beetle has shown useful in South Africa but is not yet approved in the United States. Chemical: Chemical control is challenging, because of the parrot's feather waxy surfaces a wetting agent is needed but can cause the plant to sink and cause the herbicide to wash off. The most successful to control this plant is 2,4-D, triclopyr, diquat, carfentrazone, imazapyr, and imazamox. 2. "Myriophyllum Aquaticum (parrot's Feather)." Myriophyllum Aquaticum (parrot's Feather). N.p., n.d. Web. 15 June 2016. 3. "Fact Sheet - Corophium Acherusicum." Fact Sheet - Corophium Acherusicum. N.p., n.d. Web. 15 June 2016.